Baby feels right at home in the dome. Thats because it features a comfy pad for your little one to nap on or play on and a canopy that protects baby from sun and bugs. This is awesome! It’s much more compact and less cumbersome than a pack and play, but it’s very sturdy and provides protection from the sun. My daughter naps in it all the time. I have to say I was nervous about ordering this and wondered if it was a mistake to get but WOW. Seriously this thing is HUGE compared to what I thought it would be. If I take a photo it looks smaller than it really is. 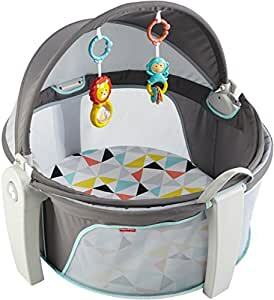 It folds up small like a rock and play, is lightweight so you can take it with you around the house or put in the car and take to relatives so baby has a place to lay down. I haven’t used it yet since baby’s still cooking but having had other children I can tell you this is so worth the value I paid. Best part unlike a play yard where if the baby soiled the cardboard fabric coated ” mattress” this is a fully removable washable pad so accidents are nothing you have to worry about. I got this triangle pattern specifically bc babies love black, white, red contrasts and although it’s orange not red I thought it’s definitely close enough and I’m sure baby will love it. I do wish the two legs on the side we’re removable so I could store this back in the box until baby’s arrival but it seems once you snap those two legs into place the only thing you can do is fold or unfold the dome…which is fine for daily use or storing in a closet or up against the wall..I just was hoping to keep it back in the box for now but now it’s too wide with the legs on to fit back in the box it came in. I’d compare this to the Graco lite playard but in a circle shape. Great space for baby very pleased with this dome. I love this thing! We purchased it so our newborn can stretch out on the living room floor without fearing our clumsy two year old’s giant feet. It’s basically a mini pack and play. Great value and I can’t wait to use it outside this spring! Great buy! My newborn sits in it beside my desk at work. Perfect little pod for when you visit family bc it takes up less room than a pack and play. Downside is once the baby can pull up/sit unassisted, you can’t use it safely anymore. But you can at least get about 6 months use out it. I still highly recommend it! Picture is how it is beside my desk at work. **He does not sleep in it like this, this was how he sat in it to look around and play. Babies should sleep in clothes that keep them comfortable without blankets and pillows and should be placed on their backs! The On-The-Go Baby Dome is a wonderful product. It folds flat, fits in the back of my Nissan Rogue along with my stroller and allows for extra storage. Itâs easy to assemble, open, and break down. My daughter was a large baby when she was born but still fits in the dome at 3 months. If weâre lucky we will get a couple more months of use out of it. The bedding part of the dome doesnât touch the ground which is wonderful when outside. The screen is the perfect size to see in but keep bugs out. I was worried about ants entering through the screen at first but I think I may have seen only one ant the entire we time weâve had it and thatâs when i left the top open. Weâve taken our dome to the beach, on an overnight stay, and use it regularly outside at home. I really have zero complaints about the product. Luckily ours was in great shape when it arrived so we didnât have to worry about returning it. As other reviewers have stated once you attach the legs you canât take them off and the product doesnât fit in the box anymore so examine the product before assembling. larger equivalent to this thatâs easy to transport and shelters baby while outside or on the go! This is a life saver! We have a pack and play but never use it because this is our go to. Our LO is 10 months old and can still use it. We have taken it to Paris and all around Germany. It is much easier to set up and lighter as well. I even brought it to the pool the other day. It gave her some shade and me a break because I didn’t have to hold her 24/7. She got a quick nap in and then played for a while as I relaxed. This is one of the best investments we made for our LO. I should have realized this product was for babies <6 months before I bought it. However, I didnât realize it until after I assembled the product. The assembly is easy but the disassembly to fit it back into the box will waste precious minutes that youâre baby is asleep...40 to be exact. Once you assemble the legs there is no going back. You will have to unscrew 10 screws just to take apart the product to fit it back in the box. Decide if you want it BEFORE you assemble the legs! If my baby was a newborn to 5 months this product would have been great. However, heâs 5 months old and heâs too old for this product.